At Valor Janitorial, office cleaning and janitorial services start with highly trained janitorial workers for each specific application. Every Valor Janitorial worker selected for our commercial cleaning team has also received comprehensive professional office cleaning training that includes classroom, written and hands-on instruction. Next, each team at each site is well managed with the proper leadership and has the highest respect for the customers that we serve. You will have the service of workers that are well trained in the best practices of many types of janitorial functions and services. Other janitorial companies will not bother to train each worker for specific best practices and customer satisfaction. And the training doesn't stop there. Each worker is trained for your specific application and to meet your particular detailed specifications. Next, we follow through. We know how to execute, and get the job done right! Our teams are dedicated and committed to performing a perfect job every time. Finally, our process includes Quality Control and continuous Customer Service. Each team leader will review and inspect the work for each commitment to ensure standards have been met or exceeded. Valor account managers and team leaders will also review and assess the job processes and incorporate improvements and customer evaluation feedback into each cleaning and janitorial service for a job site. 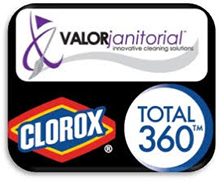 That's the difference that Valor Janitorial will bring to you!